When the time comes for someone in your life to retire, it’s an occasion to celebrate and congratulate. Retirement is a reward for years of hard work, sleep deprivation, and early mornings that come with being a working man or woman today. So, send off your friend or colleague with a smile by giving them one of these funny retirement wishes. You made it! I’m very glad to wish you a happy retirement, my friend, even if I am a bit jealous. 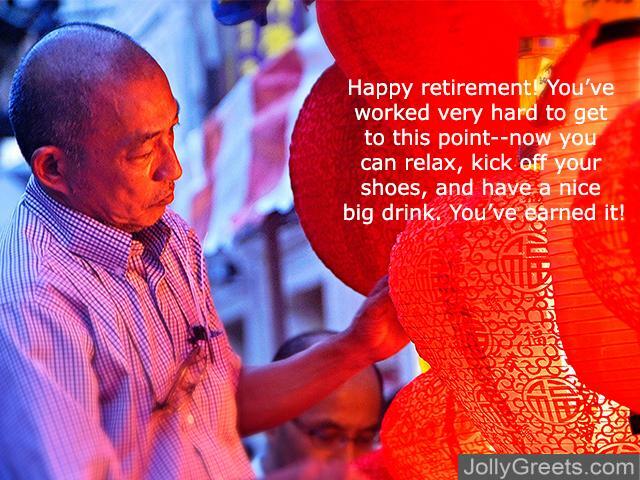 Hey friend, it’s time to kick off your shoes and relax–you made it to retirement! Wishing you much happiness and relaxation in the years to come. My dear friend, you’ve crossed the finish line into retirement and I’m so happy for you. Just don’t go trying to come back to work, alright? Wishing you all the best! Wishing a very happy retirement to my wonderful friend. It was a long time coming, but you got there in the end. Sending you all my best wishes! Happy retirement to my wonderful friend! You’ve jumped over a major hurdle, (but only figuratively, of course, considering your age), and I couldn’t be happier for you. Wishing you nothing but happiness in the years to come! It’s time for you to join me in the joys of retirement! We’re both getting old, there’s no denying it, but at least we’re in it together. Happy retirement, my friend! Hey man, happy retirement! After all those years of hard work, you’re finally going to have the time to golf as much as you want. Congrats, and enjoy these years to come! Wishing you a very happy retirement! Just think–after all those years of waking up early and losing sleep, you’ll be able to take a nap whenever you want! Enjoy the years to come, you have truly earned the relaxation and rest. Retirement gives you the time to do what truly makes you happy. Because, let’s be honest, the work day doesn’t always fill you with joy. Enjoy these precious years to come, wishing you nothing but the best. Happy retirement! You’ve worked very hard to get to this point–now you can relax, kick off your shoes, and have a nice big drink. You’ve earned it! I won’t pretend that I’m not envious of the fact that you can sleep in as much as you want from now on, but I can’t say you don’t deserve it. Wishing you an exceptionally happy retirement, enjoy the wonderful years to come! The time for your retirement has come around, and I couldn’t be happier for you. You have earned these years of relaxation and time with your loved ones, so enjoy it! 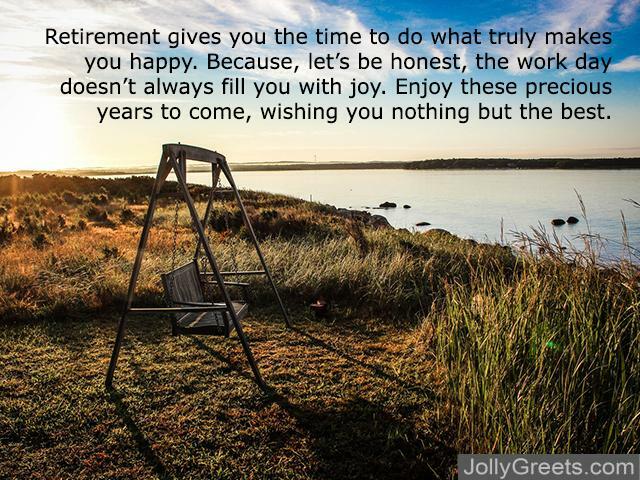 I look forward to joining you in the blissful retirement years, although I’m not ready to admit my age yet! Happy retirement to my favorite teacher! I may not have been the most well-behaved student, but I appreciate all your help just the same. Wishing you all the best in the years to come! Wishing a happy retirement to a truly amazing teacher! Thank you for your dedication to helping your students learn and grow. You helped me even when I was an obnoxious teenager, and I am very grateful to you for that. May the years ahead be ones of happiness and relaxation! To my favorite teacher: Happy retirement! I’m so glad that I had you as a teacher. It probably doesn’t seem like it, but I really did learn a lot from you. Happy retirement, teacher! After all those years of imparting your knowledge to us students, I’m sure you’ll appreciate the peace and quiet. Sending you all my best wishes! Wishing the happiest of retirements to my fantastic teacher! I’ve learned so much from you over the years, (even if I didn’t pass every test). Thanks for everything, you’re the best! What would we do without our teachers? You have taught me so much over the years, and you will be sorely missed. Although, I’m sure you can’t say the same for us! Wishing you a very happy retirement! Happy, happy retirement! It’s going to be quite different without you in the office, but I think we’ll manage, (we’ve planned for a party tomorrow). Just kidding, we’ll miss you very much. Wishing you all the best in the coming years! Wishing an extraordinarily happy retirement to my friend and colleague. I’m not sure what we’ll do without you, those new interns certainly won’t fill your big shoes! Enjoy the wonderful times to come. To my colleague and friend: Happy retirement! I think everyone in the office agrees that you’ve undoubtedly earned some peace and quiet–but how will we get by without you? This will take some getting used to, but I wish you nothing but the best! We all hope for a long and happy retirement, but that stage in life can often seem far in the distance. 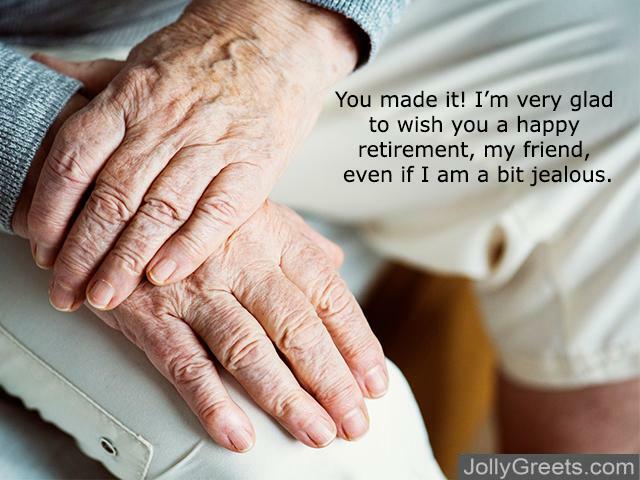 When a loved one reaches the point of retirement, mark the occasion with a funny and joyful message–they’ll love to know that you care and are happy for them.